The image above has nothing to do with today’s post. But I thought I’d suggest a way to wear the colours without going too overboard or ending up looking like a politician on the stump. This morning, on my way to a doctor’s appointment, I had a moment to stop at my $tarbucks for a quick’ish Americano. I was fasting for some lab work, after all, and the coffee held some promise of energy. Since I had a few extra moments, I sat down at one of the little tables outside and watched the passing parade of java junkies as they made their way in for a fix. There were many more women than men in attendance. And I’m afraid we men weren’t holding our own, sartorially speaking. In the fifteen minutes of observation I failed to find one man (among the 20 who must have wandered by) wearing leather soled shoes. Half of them were wearing professional clothes. Dark shirts and print ties, khakis or “gabardines,” with (utility) belts (phones and keys hanging everywhere) were the rule. And yet, I, in my suit, was the only one among them wearing nice shoes. Let me correct myself: dress shoes. There were plenty of trainers, sandals, boatshoes, driving shoes and a loafer or two. But no dress shoes in sight. People sort of bounced along quickly from parking lot to door and back. I had one moment of hope as a 1966 graduate of Washington and Lee (vanity license plate) drove up and parked. He was wearing a sort of wingtip with sneaker/trainer like soles. They were very deconstructed and undulated (for lack of a better word) when he walked. I’m sure he was quite comfortable. I was too. So much so in my Martegani’s, that I wondered why someone who went to the trouble of selecting a shirt and tie that were supposed to coördinate, ignored the grounding element of his dress. Maybe they didn’t know which shoe to choose to strike the right balance between casual and formal, comfort and utility? Herewith a (hopefully simple) guide to choosing the right style shoe for your clothing. 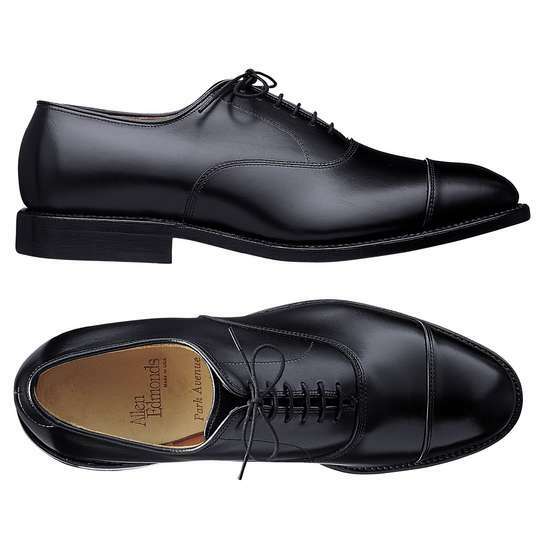 Business Suit: The oxford shoe is the shoe that is the most conservative choice. It has a closed lacing system — sort of a “V” shape that is closed when the laces are pulled tight. There is virtually o decoration on them. They may have a toe cap, they may not. Little decoration= serious business. 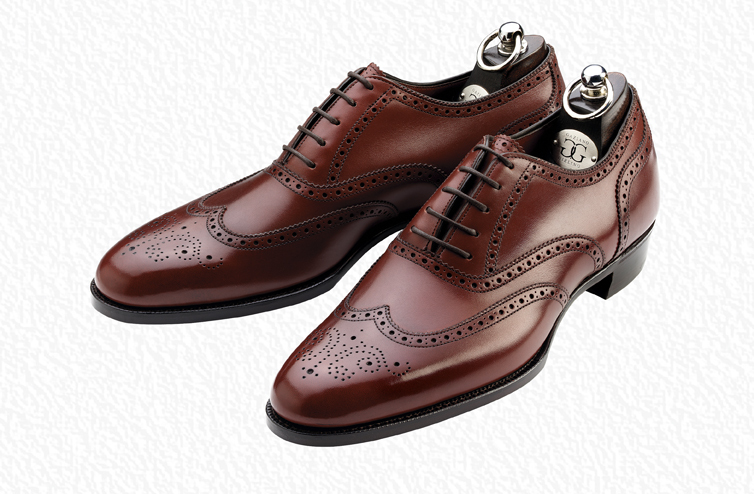 These are the shoes that you may wear with dinner clothes (tuxedo.) They come in all the standard colours. “No brown in town” still applies in parts of the world. Black are the dressiest and safest choice. 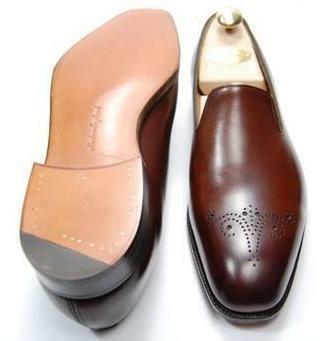 But shoes like the brown wholecuts are beautiful and appropriate for daywear in my opinion. Find a brand that has (or have them made with) waists that hug your instep nicely. They will be very elegant on your foot. Odd Jacket (or Blazer) and trousers: What has become the uniform for daywear among most men requires a shoe that is somewhere in between very formal and very casual. 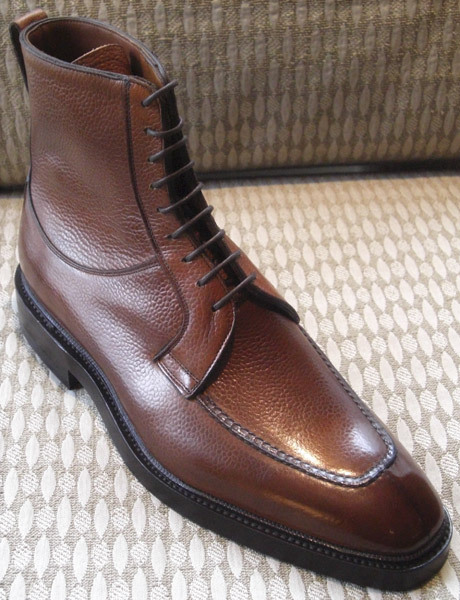 If the material of your clothing is lighter than tweed or less substantial than courduroy (more on that later), may I suggest the half-brogue or punched captoe? 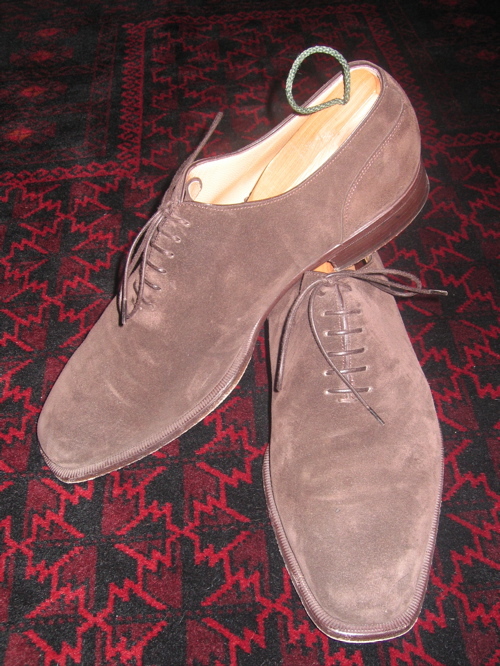 Especially in suede and especially in brown, although black and oxblood are fine. 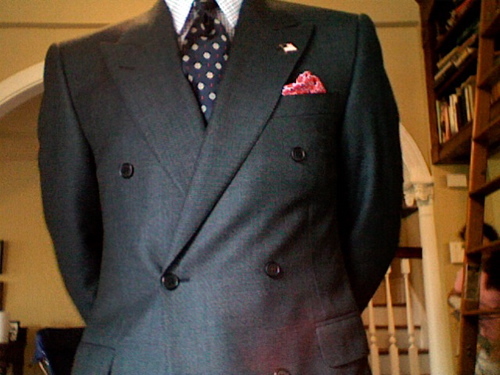 They will work equally well with a more casual suit (no three piece worsted pinstriped numbers….) worn without a tie. 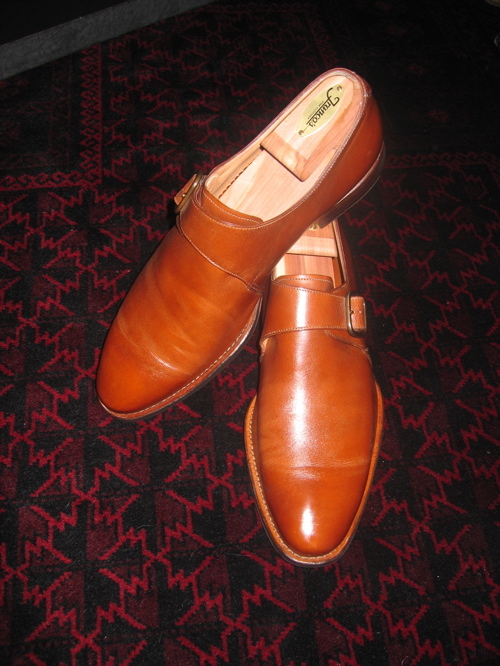 Another good choice is the monk strap or even a Chelsea boot. Slip-ons are the shoes that have no laces where you would expect to find them but have a high vamp (where those laces would be if they were there.) They are an unusual, comfortable and very stylish choice. This is no place for a pair of those low-cut, toe-cleavage-baring Italian shoes. 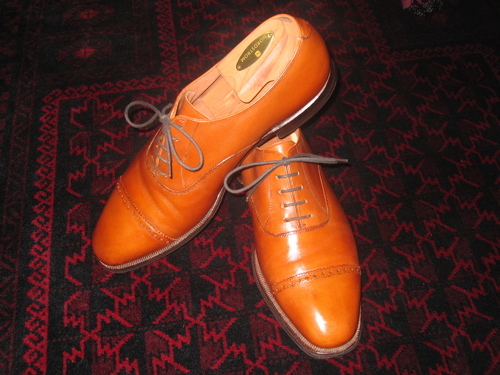 Bluchers (the ones that have the two halves of the lace-up parts sewn on top of the vamp) are appropriate for wear with odd jackets and trousers. I have a spade foot — flat on top and bottom — and before I had shoes made-to-order, they were my best bet for finding a shoe that fit. So, I got used to seeing them with suits. Mine are punched captoes or plain toes. Strictly speaking, I was mixing my metaphors by wearing them with suits. A word about Gucci and other snaffle-bit loafers. Despite what my tribe here in Richmond thinks, they are casual shoes and should not be worn with suits. I like them best with slacks and sweaters or the summer Nantucket Reds. They are a statement. Maybe not one you would like to make, but a statement nonetheless. Tweed Jacket and trousers/Country clothes: It used to be thought that the brogue (or “wingtip”) was suitable only for country wear. Country wear was a tweed suit or odd jacket and flannel or corduroy trousers. 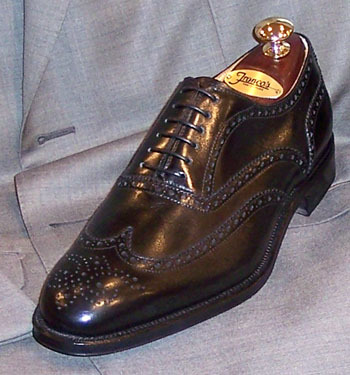 Heavy material, it was thought, could stand up to the heavier look of the heftier sole and punched leather of the wingtip. 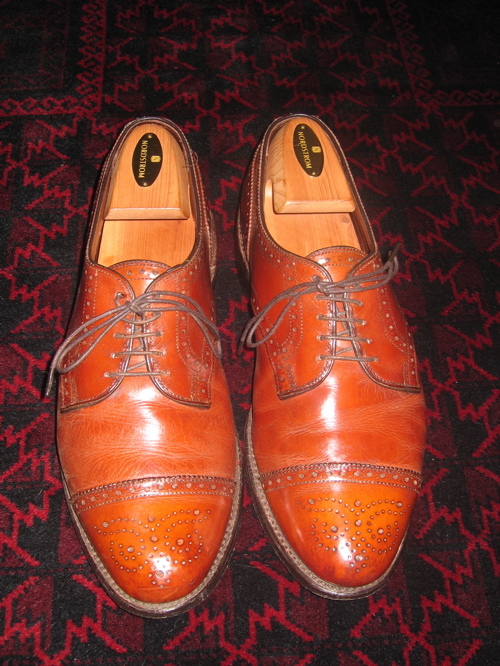 Not all wingtips these days have that heftier sole, but when they were made for country walks, they did. Mine are my storm shoes and have a double sole. My father would have called them “gunboats.” Today, wingtips have become acceptable for wear with a suit provided they have thinner soles. Half-boots are a good choice here, too. Either paddock or the Chelsea, they may also have Dainite or Vibram soles to withstand the rigors of the country lane. Pebbled leather is perfect for the country/weekend. 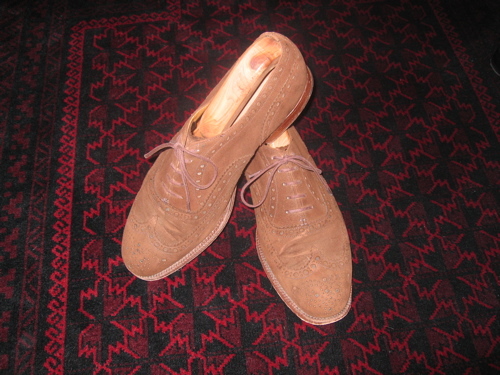 I have an old pair of brown, pebbled Ferragamo, plain toe bluchers with a Vibram sole that are wonderful with jeans, corduroys and tweeds. Casual Wear: Here defined as “no-tie and jacket optional.” Almost anything goes. But why ruin the line of a nice pair of trousers with salt-stained boatshoes? Especially if your trousers are cuffed (with turn-ups.) Thicker materials call for a more substantial shoe. 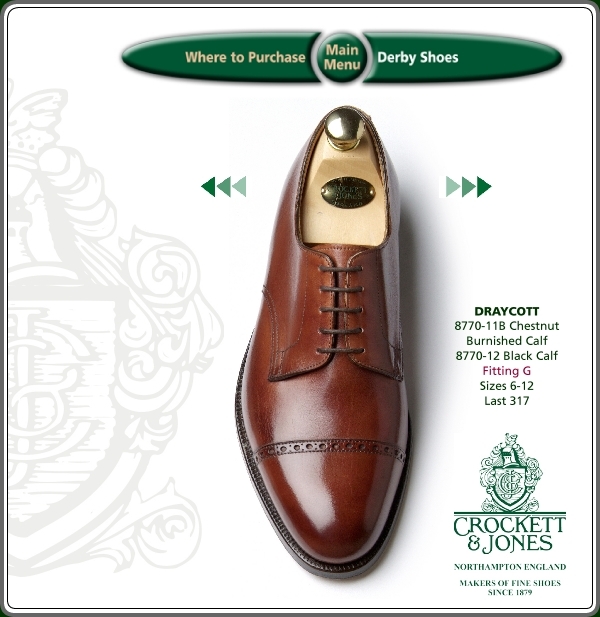 Thinner materials or slimmer cuts call for a more svelte looking shoe. A word about toes. By shoes that are the right size and you won’t feel like you need the square-toed Frankenstein shoes. A rounded toe will never go out of style. A tapered toe, chiseled toe or extremely pointy toe will go out of fashion, but it’s up to you to decide if that’s OK with you. At least they look better than the square box-toe. And finally, look for welted construction (the leather strip between the upper and sole) that are sewn in instead of glued. You are looking for the phrases: hand-sewn welt or Goodyear welted. This will make it easier to resole the shoe and is a hallmark of quality construction. 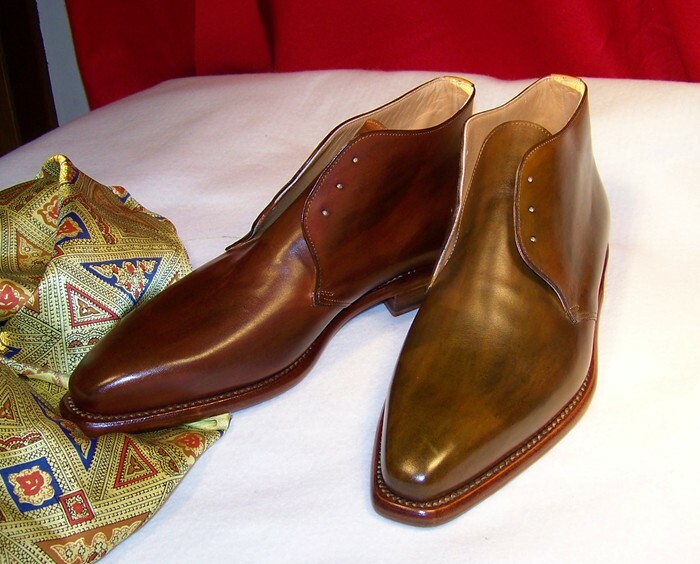 With proper care, your well-made shoes will last a very, very long time. This entry was posted in Elegantology and tagged Allen Edmonds, Church's, Edward Green, Gaziano & Girling, Martegani, Polo, shoes. Bookmark the permalink. That’s a very nice summary for shoe beginners. I might quibble with one or two or your stylistic choices (mainly the Martegani plain toe suede oxfords with a suit, or the EG Bamfords which are not my thing at all), but I think on the whole that’s a great overview. Also a very smart looking suit in the first picture. Sigh…you are taking me back to my father’s closet….and I mean that in the most complimantary of ways. 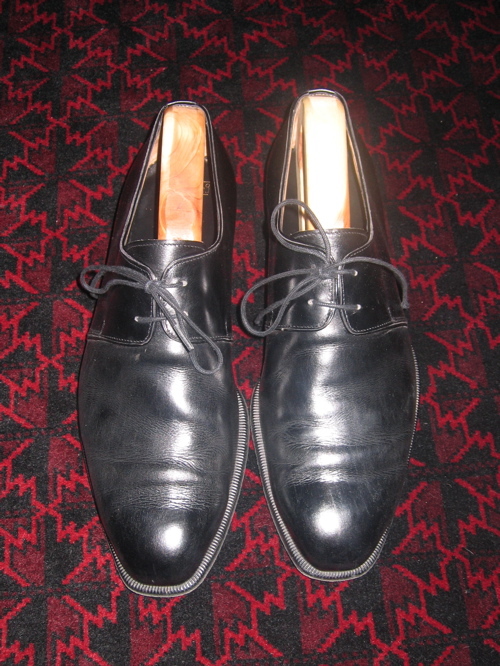 I used to love looking in his closet at all of his wingtips all with the wooden shoe forms in place. In retrospect, he was the best dressed man in many a room. Classic in every way with his wingtips for work, Topsiders and vans for weekend sailing and relaxing. Living in a much (much)less formal town like I do now, I didn’t quite realize how much I missed him until just right now. “Thanks for the memories”. It always amazes me, the disheveled look of the American Male. I notice it most in the grocery store, when you see a couple shopping together, and she is stylishly dressed, and he’s in ragged cargo shorts and a pre-faded t-shirt that fits like a tent. I will have to start looking downwards, to examine shoes. I’m bracing for the sartorial holocaust that is socks and sandals! Don’t look down. You’ll regret it. I was ashamed of myself the first couple times I did it. The shoes are lovely, but I’m much more interested in the doctor’s visit. Very much hoping all is well. That would surely put a spring in your step. 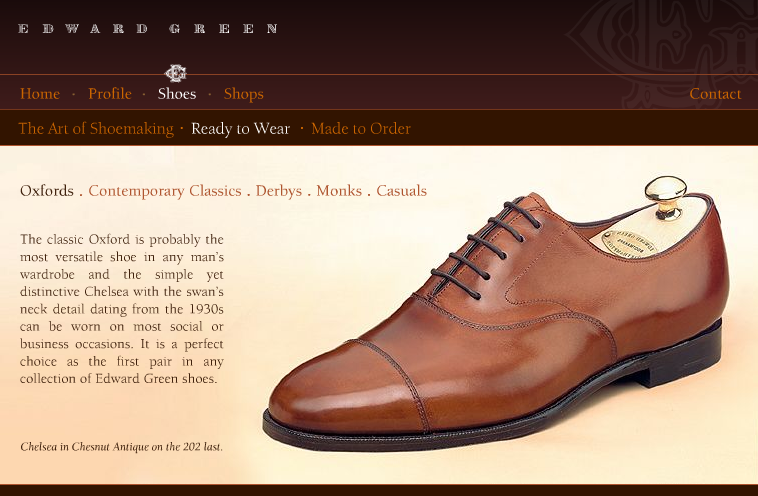 Oh, I do love really fine men’s shoes! So exquisite! Really good show of shoes here, but alas, I would not expect any less than. Yes, I ditto the sentiments of Mrs.Blandings, that a good bill of health spring forth to give a bounce to your elegant step. Need advice? A gift for my husband, 21 years coming forth and I am stumped. You seem to always have wonderful ideas. Any that you would care to share? Hello all and thanks for the well-wishes. I’m waiting for labs, but an endocrinologist friend of Mrs. E.’s says not too worry at all about any result given my history. All that’s needed now is to figure out why my blood pressure spiked. I’m chalking it up to the vente Americano on an empty stomach… . One day I’ll learn. Brian, I think that Tucker is referring to the masses in general who are so shod. And honestly, don’t be ashamed of anything. Life, in general, is a learning process. I’m 42 and still working on my theories of everyday elegance. Oh, looking down wasn’t all bad. At least my toe caps shine now. I have the exact same Church’s suede brogues. And they’re about 25 years old, and still attract positive comments. “Lasts” (pun intended) and “lifetime” spring to mind! Oh, and good to see proper trees too. Like Katie, I’m reminded of my dad and really my granddad to be more exact. That’s a complement. Hope the Dr. visit was fine. katiedid and SC, I am truly flattered. Thank you.